Whoopie pies aren’t really pies at all, but tasty cookies with a cream filling sandwiched in between two cake-like layers. The cookie’s origins are debatable. Some say they have an Amish heritage while others say they are from New England—Maine, to be precise—and according to Wikipedia there is probably some truth in both claims. A traditional whoopie pie has chocolate cookie layers with cream filling, but you can make other tasty versions as well, and a company in Maine does just that. Wicked Whoopies in Gardiner, Maine sells 11 different flavors of whoopie pies. You can even purchase a Jumbo Whoopie Pie which feeds 7 to 10 people. 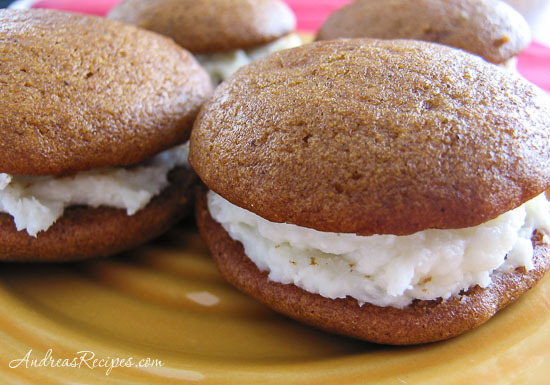 Whoopie pies are usually large, about 4 inches in diameter, but they tend to pack a calorie punch and these are no exception at 633 calories each. So I use a #40 cookie scoop which makes about 2 dozen 2-inch pies. If you want the larger size cookies, use a #20 scoop and you’ll get about a dozen. Adapted from The King Arthur Flour Cookie Companion. Makes 1 to 2 dozen , depending on size. 2. MAKE THE COOKIES: With the stand mixer, beat together the pumpkin, eggs, brown sugar, oil, and molasses. Scrape down the bottom and sides of the bowl, then beat in the salt, spices, baking powder, and baking soda. 3. Add the flour to the wet ingredients and beat on low for about 1 minute, until all of the flour is wet. Scrape the bottom and sides of the bowl, then beat on medium for a short time until the batter looks smooth. Scoop and drop the batter onto the prepared baking sheets, spacing 2 inches apart to allow for spreading. 4. Bake the cookies for 10 to 12 minutes, until they feel firm to the touch. To test, gently press your finger in the center, and a slight indentation should remain. Remove the cookies from the oven and allow them to sit on the pans for another 5 minutes, then transfer to a wire rack. Cool completely before adding the filling. 5. MAKE THE FILLING: Put the butter, cream cheese, and vanilla in the mixer bowl and beat on medium-low speed for about 1 minute, until the mixture is smooth and thoroughly combined. Decrease the speed to low and add the confectioners sugar a little at a time. Beat on medium until the frosting is smooth, about 1 minute. 6. ASSEMBLE: Spread the flat side of half the cookies with the filling. Top with the remaining cookies. Because these cookies tend to be sticky, wrap each pie individually in plastic wrap for storing. Keep the cookies in the refrigerator. 1. In a small heatproof bowl, combine the gelatin and water and set aside for the gelatin to soften. In a large mixing bowl, beat together the butter and cream cheese until fluffy. Heat the gelatin and water very gently (in a larger bowl of hot water, or at low power in the microwave), stirring to dissolve the gelatin. Set it aside. 2. Add half the confectioners’ sugar to the butter/cream cheese mixture, beating well. Add the gelatin and mix to combine. Add the remaining confectioners’ sugar, mixing until blended, then stir in the ginger. These look wonderful! I know the adults and children loved these. Yes, both young and old have enjoyed these. I sent a batch plus some extras to school for the birthday, and rave reviews came back from all the teaching staff!